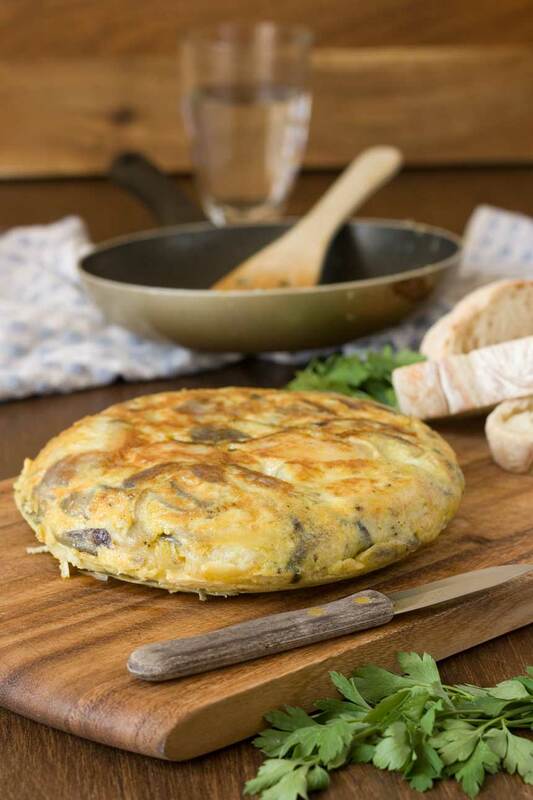 Spanish omelette is a classic Spanish staple for good reason. 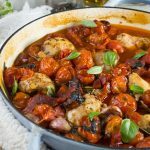 Made lovingly with just a few ingredients, it makes a perfect light meal – and it’s definitely posh enough to serve to guests. Although I’ve only just posted a Spanish recipe (this simple Spanish bruschetta), I just couldn’t wait a moment longer to post another Spanish classic and favourite – a proper Spanish omelette! 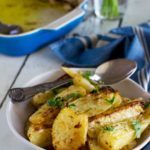 Now when I say ‘proper’, I mean cooked slowly and lovingly using just 4 main ingredients – olive oil, eggs (of course), potatoes and onions. I was surprised when visiting Spain recently to have two very different experiences with a Spanish omelette. The first one I ordered tasted just fine, but it only took one bite of the one I had the next day to realise that the first one wasn’t good at all! Does that ever happen to you? 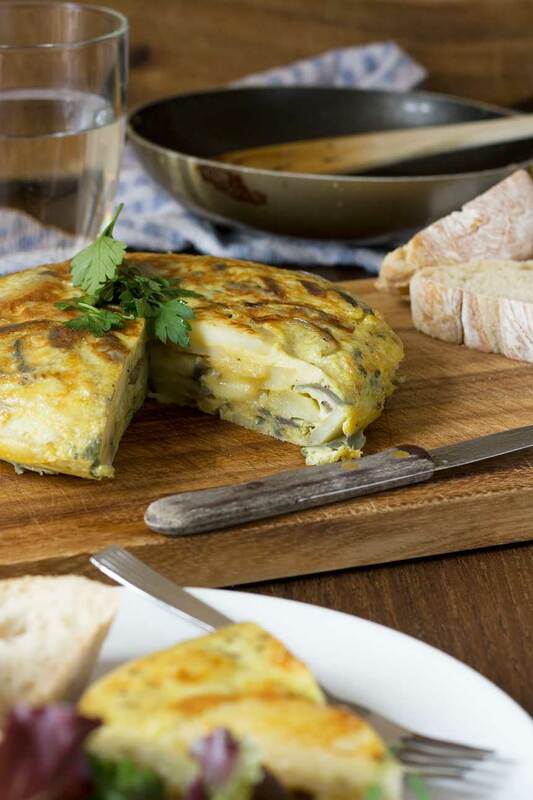 So what exactly does make a perfect (or as near as) Spanish omelette? 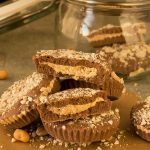 Well, I did a bit of reading around the topic before deciding on exactly how I was going to make mine, and let me tell you everyone seems to have a different opinion on how much of each ingredient to use. Some suggest cooking the onions and potatoes in a huge amount of olive oil (like 150ml huge! ), for instance, while others suggest only 2 tablespoons. Potato amounts also varied from about 200 to 600 grams. 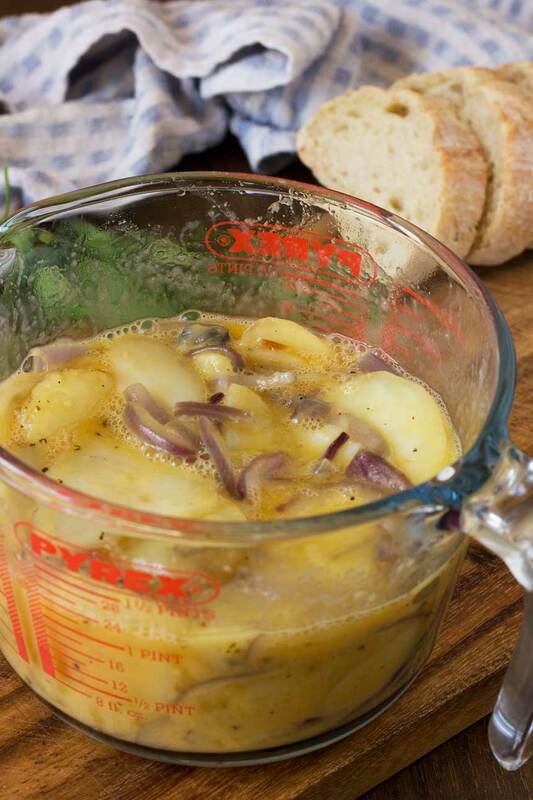 Tip the cooked potatoes and onions into the egg and leave the flavours to infuse for ten minutes. 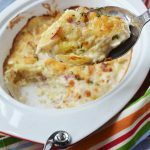 What most seem to agree on, though, is that it should be cooked slowly and with care, and that the resulting omelette should be still quite moist in the middle – not uncooked, but barely set. Which was exactly why that second omelette I ordered in Spain was so much tastier. I suspect that whichever recipe you use to make a Spanish omelette, if you follow these two rules (cook it slowly, and don’t overcook! ), you’ll end up with something absolutely delicious. After quite a bit of umming and ahhing, then, I decided to go with the same proportions used in Jane Baxter’s recipe published in the Guardian newspaper – 50ml of oil (enough to make sure the omelette had that lovely olive oily Mediterranean taste about it, but not too much so that I’d have to mess around draining it off as some other recipes suggest), and 100 grams of sliced potatoes per egg used. And most recipes I found went with one large onion, so there wasn’t much to decide there. This is another one of those recipes that I’ve wanted to have a go at for a while, but I’ve been a bit afraid of failure. For some reason I’d got it into my head that Spanish omelettes weren’t the easiest of things to get right, but I really couldn’t have been more wrong. Although you cook this slowly, it’s still a pretty easy (not to mention quite impressive) meal. Slice the onions and potatoes really thinly (about 2mm thick I’d say) so that they cook easily. Cook them in a large pan to help them cook evenly, NOT the pan you’re going to use to cook your omelette in (too small!). Cook on a LOW heat to end up with that moist, barely-cooked centre – don’t be tempted to turn up the flame! Use a small frying pan (20cm in diameter is ideal), because you have to flip this baby – it’ll be difficult to do that without breaking it if it’s much bigger. After your onions and potatoes have cooked, tip them into the whisked eggs for ten minutes to flavour them before you pour everything into the pan. Then cover it with the pan and flip both the plate and pan over so that the omelette lands back in the pan cooked side up (if that makes sense!). 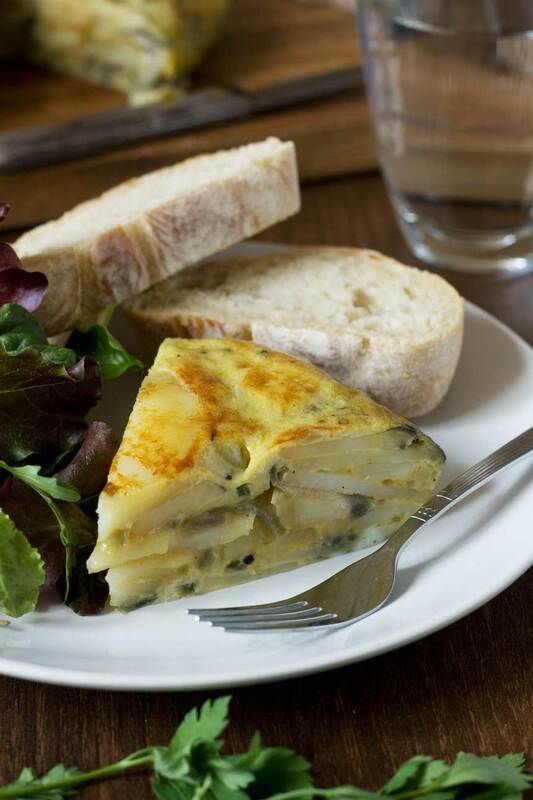 The best way to serve a Spanish omelette is to slice it like a cake. 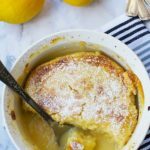 It’s great on its own, but makes a fabulous light lunch served with fresh bread and a salad. The Spanish sometimes like to eat it stuffed into a baguette, too. 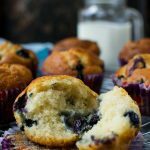 If you think that sounds like a carb overload, well you’d be right, but it tastes really, really good! In my humble opinion, one of the very best things about a Spanish omelette is that you can eat it at any time. Think of it as suitable for breakfast, brunch, lunch, afternoon snack, dinner, breakfast-for-dinner (brinner! ), or any variation in between! A Spanish classic made with just potatoes, onions, eggs and olive oil. Cook it slowly and lovingly and it'll make a delicious light meal that's hard to beat. It's even posh enough to serve to guests! Heat about 2 more tablespoons of olive oil in a smaller (20 cm) frying pan / skillet on a medium heat (use up any leftover oil in the larger pan first), then tip the egg mixture into the pan. Let it sizzle for a minute or so, then turn the pan right down and let the omelette cook slowly (uncovered) for about 8 minutes or until it’s about 2/3 set. As it cooks, run a spatula around the outside of the pan to pull the omelette in towards the centre a bit and shape it. Great idea – I’m serving it with aioli next time! 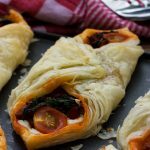 We always make this for tapas night and I have very happy memories of eating this when I was in Barcelona. 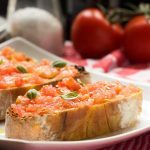 Ooh, tapas night – now there’s an idea! Looks yummy and will no doubt be in a pan near me in the next few days. Thank you for another Scrummy recipe. This is exactly how I enjoy an omelette and I love it with potatoes. You’re right, this dish is perfect anytime. I’ll certainly be trying this one, looks yummy. Thanks for another Scrummy recipe. This definitely brings back memories of travelling in Europe! 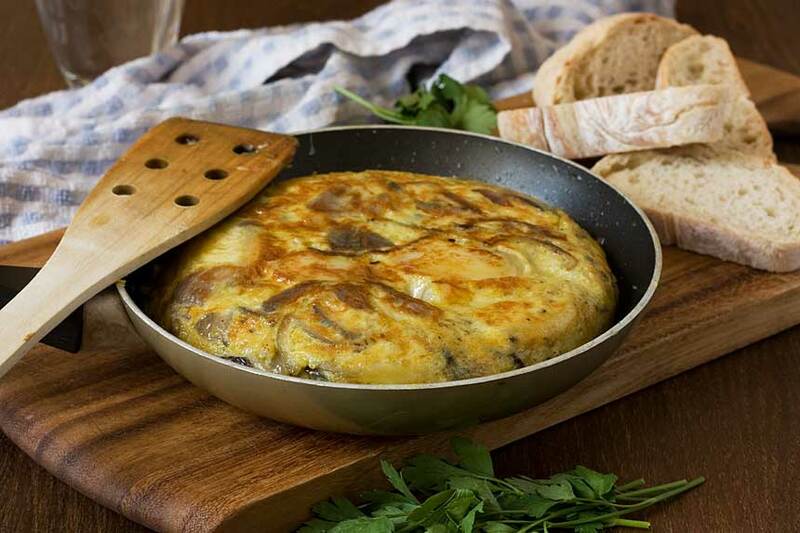 Actually, a spanish omelette (tortilla) is my favourite thing to order for breakfast whenever I see it on a menu, so I’ll have to try making it at home. Thank you for the recipe! Your Spanish Omelette turned out perfectly! I must admit that I’ve burned them once or twice so your tips are much appreciated. This and a green salad for lunch or dinner (or breakfast!) and I’d be one happy girl! Burned it?! Oh no, Marissa! Cook it sloooowly next time, and you’ll be just fine! 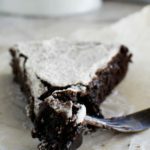 Oh my, this is one of my favorite comfort foods! I remember the first time I had a Spanish tortilla! I was at a friends house in high school (ages ago), her mom was from Madrid and she made a snack for us – a Spanish tortilla. One bite and I was like, omg what is this?! It was phenomenal! And so simply made! 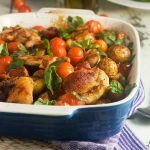 I still remember the way she’d say potato – ‘por-ta-to’ 😉 Fabulous dish, Helen! Oh that’s hilarious Kathleen… por-ta-to! I’ll think about that next time I make this! Comment tu peut bien imaginer, j’adore la tortilla de patata! Tu as raison, on peut la mangé à n’importe quelle heure. Quand je la fait pour le diner et qu’il reste un petit bout je suis très heureuse de le manger froid le lendemain au petit déjeuner. Par contre, je la préférè sans oignons! En tout cas Helen, bravo!! ta recette est vraiment authentique 😉 Hasta pronto ! 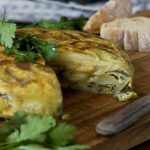 La tortilla serait bonne avec y sans les oignons – ce n’est pas du tout etonnant que c’est un classique! I haven’t had this kind of omelette in years! Looks incredible! Thanks for the reminder Helen! Can’t wait to make it! Thanks, Mira! I hadn’t made a Spanish omelette in years either – so worth the effort! Helen your photography is just stunning and your Spanish omelet is just perfect. Perfectly toasted and delicious. I love this as a delicious brunch or even dinner with a salad. Wishing you a super weekend! Thank you Lorraine! Actually, this isn’t too hard – you just have to be a bit patient. Hope you give it a go some time! I love tortillas! If you think they will be a staple in your house, you might want to consider buying a real tortilla pan. It’s like one frying pan om top of the other (one pan bottom down and one bottom up. Do I make sense at all?😉). It closes with a small hinge like a paninigrill. When the first side is done, all you have to do is hold om to the handles and flip it over. No mess or additional dishes. Works like a charm. I bought mine in the Netherlands, where I live, but you can also buy them at Amazon. Hi Monique. Thank you so much for this tip! I didn’t know such a thing existed, but will definitely check it out. It is a bit of an art doing the flipping part, isn’t it, and this would make it SO much easier! Oh! It is so difficult to eat a really good tortilla here in Spain. There is a mistery about this dish, one person makes very good tortillas, tasty and juicy, and his or her brother just does not. In my experience women make usually better tortillas. I am a man and after many years cannot reach excellence, don´t ask me why.But i have seen excellent things made without any precise rule, with or without onion and so on. Only one point: we spaniards never measure oil in the pan, just put more or less half the capacity. The potatoes must be well drained. You can get an oily tortilla using a small amount of oil if you do not have the skills to drain well the potatoes. Tortilla de patata never never never, like the britons be enslaved, must be seasoned with black or white pepper, only salt. And the fire must be high when you pour in the mixture of eggs and potatoes, and inmediately softened in order not to burn the egg. There is a fierce battle in Spain about onion in tortilla, I should say that if you are not endowed by the gods with the art of cooking this dish, as most mortals are not, onion usually makes the final result more palatable. But in my opinion really good tortillas are onionless. 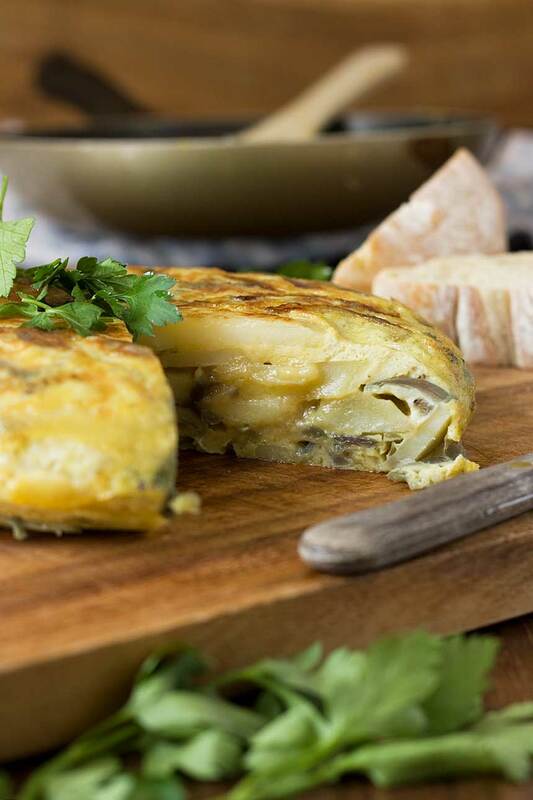 One final remark, best tortilla in Spain, as most contests and chefs agree, is cooked in the marvellous medieval little town of Betanzos, in Galicia. How wonderful to get tips on a proper Spanish omelette from a real Spaniard! Thank you so much! I will definitely give some of your tips a go next time I make this. I’m sure my recipe isn’t perfectly authentic, but it’s delicious all the same. It’s truly genius of the Spaniards to make something so so delicious with so few ingredients. I love it. this dish published on spanish media is inmediately followed by many comments like mine, he ,he. I made this tortilla the other night and served it with your tomato, corn, avocado and basil salad. It was a winner, thank you! I was a bit hesitant at having a go at this because you had to flip the tortilla but followed your instructions and it was perfect and easy to do. I will be making this again definitely. Thank you so much for the feedback, Karen! I absolutely love this simple tortilla – in fact you’ve just reminded me to make it again soon. Also great idea to serve it with the salad!